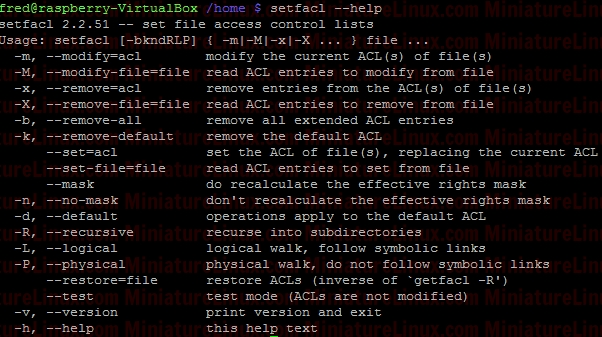 Standard Linux file permissions give us read, write, and execute for the three different types of user classes (owner, group, and other). An ACL gives superior file security by allowing you to specify file permissions for the file owner, file group, other, specific users and groups, and default permissions for each. If I login as say another user like “jon”, then “jon” can’t edit this file because it is in a directory owned by raspberry and group raspberry with file permissions for Other of r-- so jon can read the contents of the file Testfile.txt but NOT edit it. Note above that due to the sticky bit, the group of the file that jon created (jon.txt) has the group name developer even though jon isn’t a member of this group. So, at the moment, this directory is setup so that everybody can wrx however it is owned by user root and group is root. For directories, you can set ACL rights that will be assigned by defaults to files and directories created inside it. To do so, use the default identificator or the -d parameter. However, the default permissions will not be applied to the first directory.